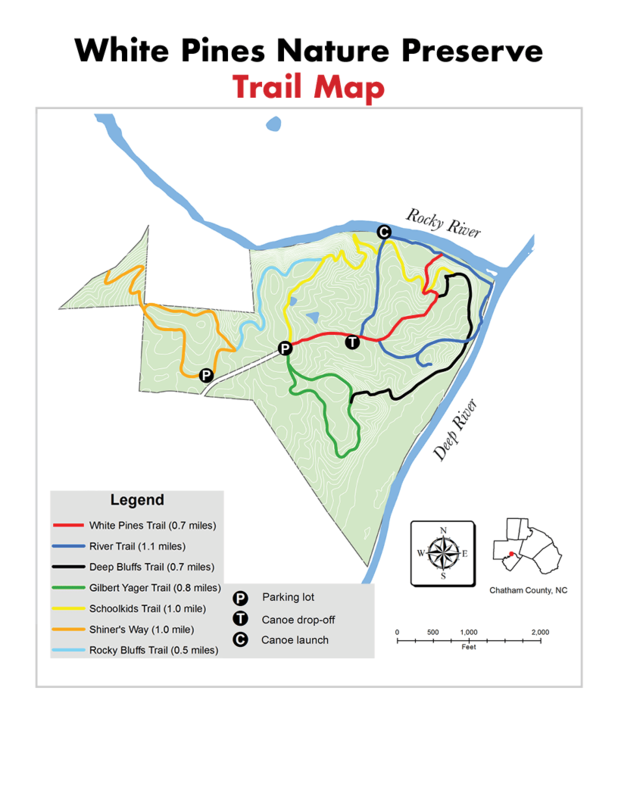 Several of the trails at White Pines Nature Preserve lead to the confluence of the Deep and Rocky Rivers. 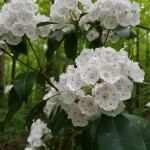 Want to give an out-of-state visitor a sense of North Carolina Piedmont’s biological diversity? Take them to White Pines Nature Preserve. The 275-acre White Pines Nature Preserve was conserved because of its namesake, a tree more commonly found in higher, cooler climates. Curiously, the white pine (Pinus strobus) was once common here — more than 10,000 years ago during the last ice age. As the climate warmed, the white pine and other cool-weather species (spruce, fir and hemlock) retreated from all but a few isolated pockets of the Piedmont, where conditions created a cooler microclimate. At White Pines, those conditions include cooler, north-facing bluffs and the cooling influence of the Rocky and Deep Rivers, which respectively form the preserve’s north and west boundaries. Temperatures here can be as much as ten degrees cooler than in downtown Pittsboro just eight miles north, making it a great summer hiking destination. As you hike the preserve’s trails, you will encounter a variety of habitats, from fern-covered slopes to damp bottomlands. 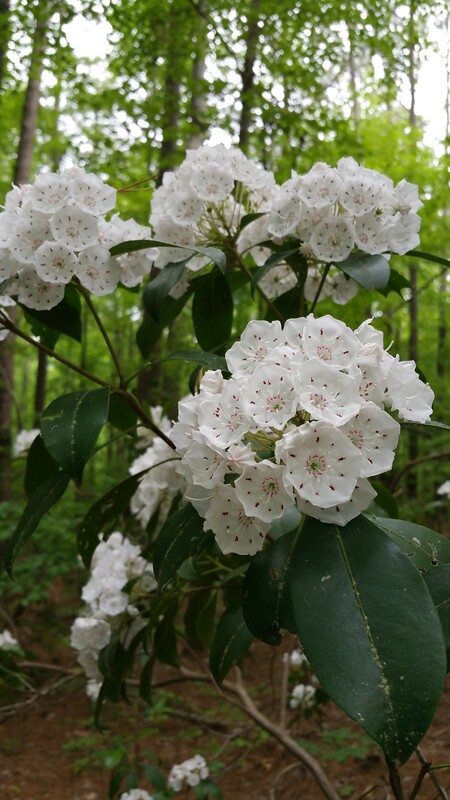 Mountain laurel and Catawba rhododendron cling to bluffs above the Rocky River. In springtime, bounteous wildflowers dot the slopes with Catesby’s trillium, trout lily, bloodroot, Jack-in-the-pulpit and a mountain disjunct population of Dutchman’s britches emerging from the leaf litter. The forest provides a corridor for wide-ranging birds such as Wild Turkey, Broad-Winged Hawk, and Pileated Woodpecker. 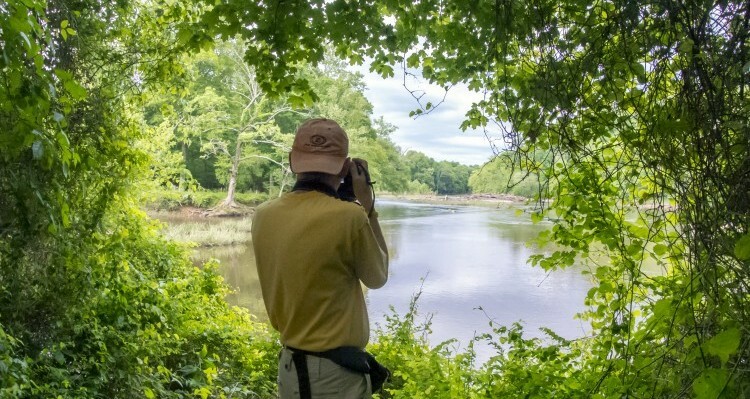 The preserve offers great birding in the spring and summer: 55 species nest here, including neotropical migratory birds such as Yellow-Billed Cuckoo, Ovenbird, Louisiana Waterthrush, Wood Thrush, and Prothonotary and Yellow-Throated Warblers. As you walk along the rivers, watch for water and wading birds such as the Belted Kingfisher, Great Blue Heron, and Green Heron. 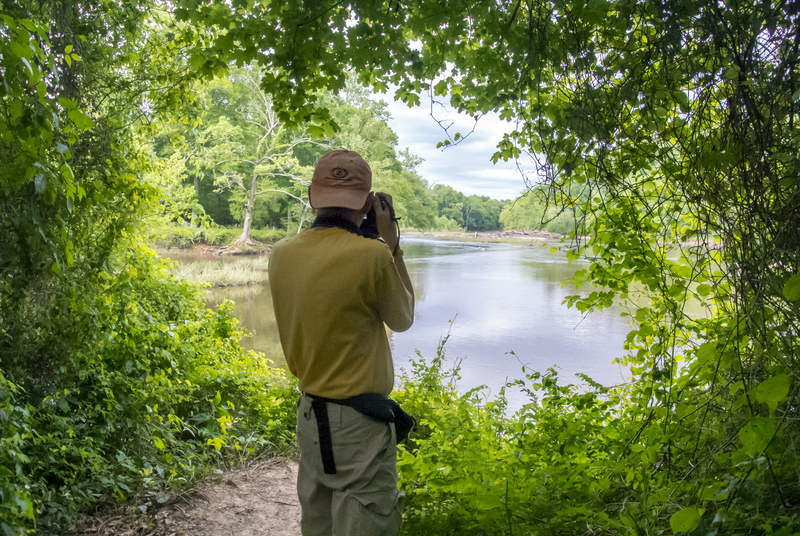 White Pines is part of the North Carolina Birding Trail, a cooperative effort to promote birding in the state. Characteristic Piedmont mammals also inhabit the preserve, such as white-tailed deer and beaver. Keep an eye out for more wary mammals such as gray fox and muskrat. During the late winter and early spring, many species of frogs and salamanders breed in rain-fed depressions in low-lying parts of the preserve. On rainy spring and summer nights, you can enjoy the sounds of spring peeper, Cope’s gray treefrog and upland chorus frog, among other species. The world’s largest known population of a federally endangered minnow, the Cape Fear shiner, is found in the riffles and rock beds at the junction of the Rocky and the Deep.The preserve provides a forested buffer that helps maintain water quality for this fragile species. Citizen Science – Check out the bird species that citizen scientists have spotted at White Pines using the eBird database. Interested in adding your own observations? You can help TLC document bird abundance and distribution by creating your own account on eBird and adding your bird sightings! 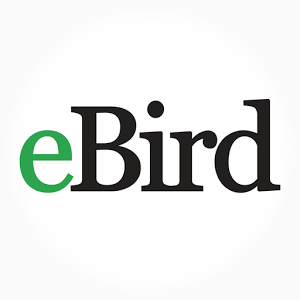 For details, tutorials, and more, check out the Getting Started section of the eBird website.